Category Archives: When We Have Failed – What Next? The best is yet to come. Do you find that hard to believe? If failure has clouded your vision to see God’s redemptive power, this booklet is for you. God’s ability to work out His best plan for your life remains. Believe it. Conclusion – When We Have Failed What Next? When We Have Failed -What Next? The morning light is shining through the window. Before you is a clean slate, never written on before. There is hope. Yesterday has passed. The gift of today has been granted to you. Walk in it. Walk by His light. Walk in dependence on Him. Remember His great grace and the height of your fall. Never forget it was His restoration and not your own work. Embrace the promise that His perfect plan for your life is still before you. The best is yet to come. Overcomers are not those who have never failed, but those who overcame by the blood that was shed for their sins. Christ’s blood is only useful for people willing to admit they have failed and in this confession find the way of victory. Whenever you wonder, “What next?” remember that your Father in heaven still loves you. Receive His gracious forgiveness and embrace it as another opportunity to be humbled and Christlike. Even now, if necessary, get up and go home. Your Father is waiting for you. © 2006 by K.P. Yohannan, the president and founder of Gospel for Asia. It was written with the intention of encouraging and edifying the Body of Christ. To learn more about Gospel for Asia or to receive additional free resources, visit Gospel for Asia’s website. Literature Crusade, 1975), p. 63. HarperCollins Publishers, Inc., 1980), p. 167. 2 Lewis, Mere Christianity, p. 204. 1 Lewis, Mere Christianity, p. 164. This entry was posted in When We Have Failed - What Next? and tagged abortion, Bible, cancer, Christianity, encouragement, Failure, gfa, Gospel for Asia, holy spirit, Hope, hopeless, Jesus, Jesus Christ, K.P. Yohannan, Missions, sickness, suicide, trinity on May 18, 2010 by gfaseo. When We Have Failed-What Next? He was a lawyer—a good one. He demanded the best of himself, and nothing less was acceptable. But he didn’t stop there. He also required the best from everyone else. Unfortunately, few could meet his standards. The truth is, there was little joy in being around him, because tension seemed to shadow him. Then a day came when everything changed. In the wrong place at the wrong time, he was accidentally shot. He lived, but lost many of the simple skills most people take for granted. He had to relearn how to tie his shoes and even how to talk. As he was forced to practice basic tasks over and over again, his personality began to change. One day while sitting at the breakfast table, his young daughter accidentally spilled her orange juice. She looked up fearfully at her father. Before, he never would have tolerated such clumsiness. This time, however, he looked kindly at her and asked, “What’s wrong?” Instead of being upset, he purposely knocked over his own orange juice and said, “It’s okay. Look. I do it all the time.” Then the father and his daughter laughed together. What a story. What a change in this man’s makeup. But what happened? When his own performance standards were so high, he had little patience for others. But constantly faced with his own mistakes, he afforded others the same grace he so badly needed. Whether or not we realize it, we all have our own set of standards by which we tend to measure others. How many times do we shake our heads at people and think, “What is wrong with this guy anyway? Why is she struggling with that? Why don’t they just . . .” In our heads, we impose a perfection that they aren’t measuring up to. We can be especially critical about matters with which we don’t struggle, the areas of our own strength. We behave like the man in Scripture who was forgiven a great sum yet was unwilling to show mercy to a fellow servant who by comparison owed only a few pennies (see Matthew 18:23–34). God forbid that we would have to get shot in order to learn how to be gracious. Who rejoices over a cure that’s worse than the disease? But how do we get to the place at which we initially respond to others out of compassion? This is an issue with which I myself have a great struggle. Do you ever find yourself complaining about a co-worker for an extended period of time? Do you rake family members over the coals for the obvious ways they are failing? How often do you catch yourself in these patterns before you even realize what you’re doing? Jesus said, “If any one of you is without sin, let him be the first to throw a stone at her” (John 8:7). You know this story: A young lady was dragged before Jesus by the religious crowd. She had failed big time. She was caught in adultery, and now by law she must be stoned to death. Jesus was challenged to give His judgment. The tension was thick. Christ answered, “If any one of you is without sin, let him be the first to throw a stone.” What do you think He was saying to that smug group of people? Did He say, “He who has not committed adultery like this woman can cast the first stone”? Believe it or not, we are all pretty much cut from the same piece of cloth. Some of us are clever and are able to hide our problems, but we are still much the same on the inside. And within that realization lies our answer. Christ who knew no sin showed compassion to this woman, saying, “Neither do I condemn you” (John 8:11). How much more should we, who know all too well the sting of sin and failure, show compassion to our brothers and sisters? Sometime back, a friend shared with me some of his burdens. I listened prayerfully, asking the Lord to help me understand what he was going through. One after another he talked about discouragements and failures that seemed to have gotten the best of him. He said he still read his Bible and prayed, but it all seemed so lifeless; what he felt was that God Himself had forsaken him. His wish was that he could quit everything and just run away. “I am in a fast-moving train, and I am so tired. I just want to get off, but this train isn’t stopping for me.” Tears fell unchecked. His whole body seemed to bend under a staggering load. I sensed the Lord asking me if I would represent the compassionate, caring, restoring person of Jesus in my words to this man. Thank God the story ends well. After listening for a long time, I shared my heart and laid my hands on him and prayed. He left the room a changed individual. This prayer on behalf of the Lord brought recovery, and a month later he was serving the Lord with the excitement and energy he had before. Right after he left my room, the words, “You be my Jesus,” came to my mind. I realized how we all need that physical touch of someone who will be the ministry of Jesus to us. not a star in the sky. It seems this night is forever. forcing me to shut them in the dark. to lend a helping hand? Some years ago, when I described to my wife my frustration about a given individual—a very difficult person to deal with—she said to me, “You are forgetting something: God wants him to succeed. We must cooperate with God and work toward that end.” The Lord used her words to change my thinking. Jesus is a picture we can look at of what God our Father is like (see John 14:9). Through His example, we can learn how to be the “ministry of Jesus” to others. This way we can cooperate with what God our Father wants to do in our world. One example from Jesus’ life is the encounter He had with the Samaritan woman (see John 4:5–42). She had been the object of town gossip, and to even be remotely associated with her was a public disgrace. I am sure she spent her days trying to ignore her various “judges” around the village as well as her inner struggle with the sin in which she kept finding herself—five failed marriages and now she was living with a man. But Jesus, a Jew, talked graciously to her. (It was not appropriate for Jews to speak to Samaritans because they were considered the low caste.) Our Lord, however, did not talk down to her. He didn’t make her feel small like everyone else probably did. Yes, He brought up the matter of her sin. But in spite of this, she didn’t defend herself or leave. Apparently she felt welcome in His presence. If she sensed in Him any disdain toward her, even if she had “discerned” Him a prophet by His word of knowledge, I don’t believe she would have lingered for very long. Jesus did not preach a three-point sermon about the wrong turns she had made in life and what she needed to do differently. Instead, He welcomed her into the kingdom—transforming and restoring her by His love. When He sensed her need, His response was an overwhelming tide of compassion. So much so that He wasn’t even hungry anymore. Later we see Jesus at the pool of Bethesda (John 5:1–15). Here He learned there was a man who had been ill for a long time. Upon hearing this news, Jesus reached out and healed him instantly. Because of sin, this man had been sick for 38 years. Yet the Lord granted him a new beginning and a new life. Our Lord could very well have exposed his sin to those who stood around and made it into a great sermon illustration. Only later, when Jesus was alone with him, did He tell him, “Stop sinning or something worse may happen” (John 5:14). Paul says in Philippians 2:5 (NKJV), “Let this mind be in you which was also in Christ Jesus.” So we are called to be partakers of the nature of our Lord Jesus Christ. These are the same characteristics God wants us to use as we minister to those who have failed. Again, we are challenged to walk in the footsteps of Jesus. He is our example. No matter where we go, we are surrounded by people who have failed and are still hurting. Most of them are desperately lonely. Let us extend Christ’s compassion to them. What these people need is the Lord. This entry was posted in When We Have Failed - What Next? and tagged abortion, Bible, cancer, Christianity, Discipleship, encouragement, Failure, gfa, Gospel for Asia, holy spirit, Hope, hopeless, Jesus, K.P. Yohannan, Missionaries, Missions, sickness, suicide, trinity on May 13, 2010 by gfaseo. Years ago a man came to me seeking counsel. He served as a full-time minister and was very well-known for his extraordinary giftings. Within the first few minutes of our time together, he broke down weeping. I could hardly make out what he was saying because of his intense sobbing. Finally, through his tears, he voiced his deep pain with these few words—“I lost it all. I failed.” He had fallen into adultery. His sorrow was deep and his repentance more sincere than any I have ever witnessed. He knew the depths of his failure and was crying out for mercy and hope, wanting to believe they were still available to him. By the grace of God, I was able to speak the words he needed to hear and to pray with him. Years later I learned that this gentleman who took such a hard fall had fully recovered. God’s grace was lavished upon him and brought restoration. Now his life and his gifts were being used in multiplied ways, more than he ever thought possible after such a moral failure. Through the years, I have witnessed similar situations, revealing the gracious way God works. There is an irony here, however. I have also witnessed younger brothers, placed in less influential settings, fall in minor ways and lose it all. There is no adultery or murder, yet these who failed in what many would consider smaller ways are sometimes driven out of the ministry by what they have done. It makes me wonder, “What happened?” The veteran who should have been wiped out from the ministry is restored and thrives, his life being used to touch thousands of people, while the rookie who really didn’t steal all that much lost out completely. How do you explain this? It’s not the size of our sin that determines whether or not we recover from a fall. It’s our response. How we deal with our failure determines our future. God desires to make your life into something beautiful and bring about His purposes through your failure. He wants to accomplish His perfect will in your life, but He is waiting on you. Just as there are real-life examples from Scripture and the people we know who demonstrate God’s great skill to still bring about His best in the midst of failure, there are also real-life examples of those who never fully recover. So there is still a question of whether God’s best for your life will be experienced. It is yet to be decided . . . by you! How will you handle what is before you? Will you surrender your heart and your ways to the Lord and let Him do His work of humility within you? Or will your pride rise up and keep you captive to a life that never fully recovers? Today He is rooting for you. I also encourage you with all my heart to take these simple steps to recovery and a life that refuses to settle for second best. God tells us that He desires honesty in our inward parts (see Psalm 51:6, NLT). Honesty is the foundation of all good things God does in and through us. In Ephesians 6, truth is the first piece of spiritual armor we are told to put on. This belt of truth is worn around our waist, the middle of our bodies and the center of our balance. Honesty and truth must be in place before anything else because they keep us from losing our balance and falling. This is not the truth that is simply the opposite of lying. Instead, it is a willingness to come before the Lord without any excuses and sit quietly, letting Him search out our heart. It is an openness to hearing His still small voice that all too often people keep trying to cover up. Then we must listen closely for what He says. Only then will you be able to understand, without justification and explanation, without twisting the truth to put yourself in a more favorable light, the gravity of what you have done. It may be painful for the moment, but this truth will set you free. The Lord can then begin His cleansing in your heart. This cleansing by His Spirit far outweighs any brief moments of pain. It is in this experience of exposure, this act of truly being transparent before the Lord, that the way is cleared for the Spirit to really work in your life. It is the beginning of a deeper work and the foundation for accomplishing His perfect will for your life. For each one to whom God’s best was restored, the road to recovery began with honesty and admitting their failure: from David who told Nathan, “I have sinned against the LORD” (2 Samuel 12:13), to Jacob who finally admitted both his name and his character was Jacob, the deceiver (Genesis 32:27), to the thief on the cross who affirmed that he deserved his judgment (Luke 23:41). It was in those moments of truth for each of these men that their restoration began: that Nathan told David the Lord took away his sin and he was not going to die (2 Samuel 12:13), that Jacob’s name was changed to Israel, the prince of God (Genesis 32:28), that Jesus informed the thief on the cross that today he would be with Him in paradise (Luke 23:43). In those moments of honesty, the Lord may also show you practical steps of restoration that He wants you to take. Listen to His voice and act on what He puts on your heart. The present awkwardness is nothing in contrast to the joy of our inner man being clear before God and man. Be aware that admitting your failure in honesty before the Lord is the exact opposite of what your flesh wants to do. When Adam and Eve sinned, their first reaction was to run for cover. Shame entered the scene, and ever since, humanity has tried to hide its failure. The reason? Simply pride, the desire to keep who we are intact. I advise you against this. You will only put up a roadblock on your way to recovery. You cannot skip this part and move on to the next step. It begins here or ends here. Some hide not only from the searching of God’s light, but also from those who know their failure. Though sorrowful over the way they failed, their pride keeps them captive. They go through life cutting off relationships and avoiding those who know their flaws, never admitting any wrong and never fully recovering. Don’t let the fear of man hinder what God has in store for you. Go ahead—meet that person, make that call, send that email. Return what you owe. Ask for forgiveness. For the “fear of man will prove to be a snare” (Proverbs 29:25). The brief pain of reality doesn’t compare to the lasting joy and peace experienced in God’s restoration. Step into the cleansing and the new life that awaits you. You must next accept God’s forgiveness. Many people today say God forgave them, but they still live with their failures clouding their lives and casting shadows over their days. They really have not believed His forgiveness. When others have not forgiven us, it can be difficult to cling to the Lord’s forgiveness. We almost feel it is wrong to accept God’s forgiveness when others are still hurting. Yet it is not wrong. It is God’s desire that we accept His gift of forgiveness and journey on the road to restoration. Give others the time and space that they need to work through their struggles. But we must receive with gladness the gift God has given us. The Lord makes it clear in His Word: “If we confess our sins, he is faithful and just and will forgive us our sins and purify us from all unrighteousness” (1 John 1:9). What He has told us, we must simply believe. You see, it is God’s free gift of righteousness. Notice I said free—it is not something we earn. Sanctification, yes—we fail, repent, grow continually day-by-day, becoming more like Jesus. But righteousness is not a growing process; it is simply a gift from God. We are made righteous in Jesus, through the Father’s grace. It says in Romans, “God will credit righteousness—for us who believe in him who raised Jesus our Lord from the dead. He was delivered over to death for our sins and was raised to life for our justification” (Romans 4:24–25). When Jesus died on the cross, provision for sin was made. We can be washed clean. Before God, it is as though our sin never happened. Can you imagine—the divorce never occurred or the cheating never took place? You never lied or lusted. You never fought with anyone. You never thought evil. You never committed murder. Through Christ, you are made as pure as the day God made Adam and Eve. This is difficult for our minds to grasp and our hearts to believe—but it’s true. When God looks at you, He now sees the righteousness of Jesus. Receive His forgiveness that washes you white as snow. Our enemy prowls around “like a roaring lion looking for someone to devour” (1 Peter 5:8). In vulnerable times when we are face-to-face with failure, Satan seeks to discourage us to the point where we lose all hope. At such times, we can become so introspective that we wallow in despair and forget the grace and forgiveness God has given us. We become so preoccupied with our failures that our enemy wins the battle against us simply because we give up. If we are to stand against this roaring lion, we must realize that a defeated mind-set is not from God; then we must—absolutely must—resist the devil and his lies. Our faith, the blood of Jesus and our testimony are powerful weapons to resist the enemy who seeks to destroy all hope for the future and the plans God has for us. Ephesians 6:16 tells us that we must take up our shield of faith by which we can quench the enemy’s fiery darts and stand against this accuser of the brethren. By the sacrifice and blood of Jesus, Satan’s head was crushed. By our testimony, we confess with our mouth Jesus’ victory over the enemy. We refuse to accept thoughts of confusion, accusation, guilt, condemnation and whatever else he may conjure up. We reject these because of what Jesus did for us and because we are “accepted in the beloved” (Ephesians 1:6, KJV). Then what happens? “The accuser of our brothers, who accuses them before our God day and night, has been hurled down. They overcame him by the blood of the Lamb and by the word of their testimony” (Revelation 12:10–11, emphasis mine). The devil is a defeated foe. Don’t be fooled by his blustering. Along this journey of restoration, every step requires that we believe His Word regardless of our feelings. So—we must believe there is hope. We must believe that His best remains. We must believe that His road of humility is better than our road of pride. We must believe His restoration is more important than our reputation. We must believe He truly forgives us. And we must believe that by His blood, Satan’s head was crushed. The answer for which you are searching lies in believing God. This is a life of faith. Our salvation started with it, and our journey on earth will end with our first act of faith becoming sight. And all along the journey, the only way we continue strong is by faith—faith in God and in His goodness. He is constantly working with us and is able to finish the good work that He started (see Philippians 1:6). My brothers and sisters, nothing, absolutely nothing, is impossible with our God. This entry was posted in When We Have Failed - What Next? and tagged abortion, Bible, cancer, Discipleship, encouragement, Failure, gfa, Gospel for Asia, holy spirit, Hope, hopeless, Jesus, Jesus Christ, K.P. Yohannan, Missionaries, Missions, sickness, suicide, trinity on May 11, 2010 by gfaseo. In the 1950s, Charles Templeton was a household name among evangelical Christians. He was a close friend of Dr. Billy Graham and the pastor of a large and growing church in Toronto, Canada. He was also a mighty evangelist and in some ways was more eloquent and able than Dr. Graham. Many predicted that Charles would become one of the most famous preachers in history. Together, Graham and Templeton had founded Youth for Christ in Canada. Not that many years later, news came out that Charles Templeton had walked away from the truth of the Scriptures and the God he had proclaimed to millions. Templeton declared himself to now be an agnostic, and his announcement sent shockwaves through the church world. In spite of his disbelief in a loving God, Templeton continued to give much thought to God and his struggles with Christianity over the rest of his life. He wrote several books about these concepts with which he grappled. In 1999, Templeton published his last book, titled Farewell to God. The book’s subtitle was My Reasons for Rejecting the Christian Faith. Author Lee Strobel was fascinated with the volume and sought an interview with the Canadian to gain more understanding into this man’s journey. Strobel ended up writing his book The Case for Faith in response to that meeting. In it, Strobel recounts that eventful conversation. Strobel had gone to Templeton’s high-rise apartment in Toronto to sit with this 83-yearold man. At the time, Templeton’s health was failing with Alzheimer’s. For some minutes, Strobel pressed Templeton about his beliefs in God. Growing more strong and adamant, Templeton made it clear that he could not reconcile believing in a God who seemed to permit random cruelty and evil. He stood his intellectual ground, giving no hint that anything could change his hardened position. He stammered: “I . . . I . . . I adore him. . . . Somehow, this minister who early in life was a strong Christian leader lost his faith. He let go of the Jesus he loved so dearly. How could something like that happen? No one is immune to failure.No matter how much knowledge or experience or revelation one might have, no one is exempt from tripping spiritually. None of us should ever presume to have “arrived” or to be stable enough not to fall, even significantly. Not even a spiritual stalwart who has been faithful for the past 50 years is immune to crashing. The Bible warns us in 1 Corinthians 10:12, “If you think you are standing firm, be careful that you don’t fall!” I pray that in the areas in which you believe yourself to be strong that you choose to humble yourself. Be careful to continue in His grace, for He gives grace to the humble, but by His own Word, He must oppose the proud (see James 4:6). 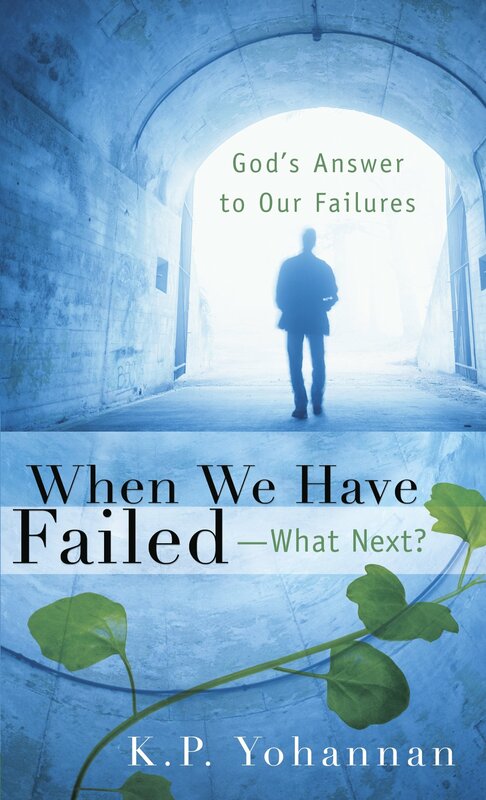 If no one is immune to failure and if God will not prevent failure, could it be that God has a purpose in it? God’s purpose in our failure is that we become more like His Son, Jesus. Jesus described Himself only once in Scripture. He said, “I am gentle and humble in heart” (Matthew 11:29). It is the pride within our hearts that is most contrary to Christ and the most like Satan. Yet pride is the sin that so easily runs rampant in the human heart. Failure is one of God’s best tools to transform our prideful hearts into a heart like His. God allowed Peter to fail and be sifted. As a result, he was cleansed of so much chaff in his life. He was made more like Christ than he had ever been before. for your souls. For my yoke is easy and my burden is light” (Matthew 11:28–30). His invitation is before us. His way is clear. Restoration is near. God wants to bring about His purpose through our failure, but before He can do that, we must come to Jesus and be willing to learn from Him. What Does He Want to Teach Us? fighting against it, not by giving in. . . .
“For it is by grace you have been saved, through faith—and this not from yourselves, it is the gift of God—not by works, so that no one can boast” (Ephesians 2:8–9). It is through our failures that God often helps us see our need for salvation—both eternal salvation and the daily walking away from the desires of the flesh to pursue those of the Spirit. Paul asks the question in Romans 7:24, “What a wretched man I am! Who will rescue me from this body of death?” And he answers himself in verse 25: “Thanks be to God— through Jesus Christ our Lord!” So finally we realize we cannot walk down this road and not fail, except through Jesus Christ our Lord. Through this revelation of God’s grace in our lives and our critical need for the Lord, humility naturally unfolds in our hearts, affecting the way we view ourselves, the way we view God and the way we view others. It chips away at our strong exteriors and prideful hearts, helping us realize that if it weren’t for the Lord’s mercy and grace, we would all be consumed. It is with this new understanding that God can bring about true victory in our lives. Bible teacher and friend Zac Poonen says, “Genuine victory over sin is always accompanied by the deepest humility.”4 God wants us to have that victory. He has promised us that He will never allow us to be tempted beyond what we are able to bear (see 1 Corinthians 10:13). Yet so often it seems that victory eludes us. It is when our self-confidence is finally destroyed and is replaced with dependence upon God that we have victory. Jesus encouraged His disciples just before His arrest to “pray so that you will not fall into temptation” (Luke 22:46). He knew that only with dependence on the Lord would they be able to stand. “Unless the LORD builds the house, its builders labor in vain” (Psalm 127:1). God transforms not only our relationship with Him, but also our relationships with others. God begins to do a work of compassion in our hearts. Our failure helps us see that we are no different from any other human being. We are as prone to failure as anyone else. A heart of hard judgment turns into a heart of compassion when we identify in a real and practical way with the rest of flawed humanity. Several years ago, a pastor and friend of mine was in a terrible car accident. He fell asleep at the wheel, hit a post at high speed and crashed the car. His wife died instantly, and he was in the hospital with complications of all kinds. Not long after the accident, I visited him in the hospital. It was difficult to see a man of God not just suffering physically, but also bearing the emotional strain of having lost his wife in such a tragic way. Jesus told Peter, “And when you have turned back, strengthen your brothers.” It is only when we are broken that we have the right kind of strength to strengthen others. It was only when Peter was weak and broken that he became truly strong—so much so that he was able to strengthen his brothers and sisters. We could say that Peter’s preparation for that Spirit-filled service on Pentecost came through his experience of failure. Without his encounter with his own shortcomings, he would have stood up to preach on that day as an arrogant man—one who had not failed and who would look down with ridicule at the poor, lost sinners in front of him. faithful (see 1 Corinthians 1:9). Whether the Lord is succeeding in fulfilling this end in your life or not, you alone know. But if the chaff is being removed, you will be humbler and less self-righteous. You won’t look down on others who fail. You won’t consider yourself better than anyone else. You will become more like Jesus. Let us learn from Him. This entry was posted in When We Have Failed - What Next? and tagged abortion, Bible, cancer, Christianity, Discipleship, encouragement, Failure, gfa, Gospel for Asia, holy spirit, Hope, hopeless, Jesus, Jesus Christ, K.P. Yohannan, Missionaries, Missions, sickness, suicide, trinity on May 6, 2010 by gfaseo. When We Have Failed What Next? Because God is good and everything He does is good, we can safely assume that all He creates is good. So in the beginning when God created heaven and earth, they were good. Between Genesis 1:1, when out of His goodness God created the heavens and the earth, and Genesis 1:2, something happened. We are informed that what was created became “formless and empty, darkness was over the surface of the deep” (Genesis 1:2). What does this tell us? In the beginning what was made good apparently became bad. How? Numbers of theologians believe this is when the angel Lucifer fell because of his pride (see Isaiah 14:11–15; Ezekiel 28:13–18). From the beginning of time, however, we see the marvelous, compassionate way that God responds to catastrophes. After realizing that what He created was now covered with darkness, God didn’t decide to just abandon it. No. He refashioned this planet that had lost its original beauty. When this was done, “God saw all that he had made, and it was very good” (Genesis 1:31, emphasis mine). Now if God who is perfect thinks something is very good, it is very good. In fact, His new earth became the home for His Son’s bride. It was definitely not a secondbest place. Not long after the introduction of the first man and woman, another great failure occurred. These human beings formed from the clay of the earth by God’s own hands, made in His own image, fell prey to the deceiver, and Paradise was lost. An angel with a flaming sword was posted at the entrance to the Garden of Eden so they would never be able to return (see Genesis 3:24). What was God going to do now after the whole purpose of man’s creation— fellowship with Him—was lost? Well, He immediately gave them a most wonderful prophecy, the promise of the seed of the woman, who is the Lord Jesus Christ, our Savior (see Genesis 3:15). Does this mean the cross was God’s second best because His first plan for mankind failed when Adam fell? If we say that the coming of the Messiah and the cross (and what Jesus accomplished through His death) were an inferior choice next to God’s original plan, it would be blasphemy! From this point onward, man fails. Yet through this, we can still see how God magnificently weaves together His amazing plan from the beginning of history. Abraham. Further into the book of Genesis, we encounter Abraham. He had faith not only to leave his homeland and set out on a God-given quest, but also the faith to receive a child in his old age. And not just any child—this was the child of promise, the embryo of a great nation that would eventually number more than the sands of the seashore. Along the way, however, this faith hero fell into lies and deception. Because he was afraid for his life, Abraham told his attractive wife to inform the Egyptian pharaoh that she was his sister rather than his wife (see Genesis 12:10–20). Not only that, after Abraham received the promise from God that he would have innumerable descendants, impatience got the best of him. Thinking God could produce the son without Sarah, he had a sexual relationship with her servant who conceived a child (see Genesis 16:1–2). After all this, God restored him, used him mightily and even brought His own Son Jesus into the world through Abraham’s line. As a matter of fact, the whole Christian world of those who believe are children of Abraham (see Galatians 3:6–9). Samson. This powerhouse of a man was called by God to deliver Israel from the hands of the Philistines (see Judges 13:5). Yet he lacked moral conviction and common sense when it came to women. There came a day when it looked like Samson’s folly totally destroyed what God wanted to do through him. Samson was forced to serve the very enemies he was born to conquer. Yet once again, the Lord made the reworked vessel better than the former one. Scripture reports that Samson did more to deliver Israel from the hands of the Philistines after his failure than he did in his 20 years of leading Israel (see Judges 16:30). Resaid, God was still able to bring about His perfect plan through Samson’s life. Thomas. Everyone thinks of him as “doubting Thomas.” This privileged man walked with Jesus during His ministry on earth and knew Him face-to-face. Unfortunately, when the other disciples had the opportunity to see their Lord after He was raised from the dead, Thomas did not. Their excited reports seemed too good for him to believe. “Whoa,” responded the absentee. “Unless I see the nail marks in his hands and put my fi nger where the nails were, and put my hand into his side, I will not believe it” (John 20:25). Before long, the day came when he stood face-to-face with his Lord, and in the presence of his colleagues, he came to grips with his lack of faith. I’m sure Thomas was grieved by his own skepticism, this reluctance to believe that Jesus could do something so amazing. But was that the end of his usefulness to the Lord? No. Again, the Potter made a more beautiful vessel than what was there before. He chose Thomas to go to one of the hardest regions in the world at that time, to far-off India. Through his great faith and ultimate martyrdom, this extraordinary disciple established the Church in my nation. In fact, in A.D. 52 Thomas traveled to Niranam (the village where I was born), shared the Gospel and established a church. And 1,900 years later, God granted me the privilege of being born into a family of believers in that very village. So my spiritual life traces its roots to the labor of Thomas so many generations back. I personally am convinced God was able to bring about His perfect will in the life of this one who earlier was a doubter. Mark. This is the young man who deserted his teammates on his first missionary assignment. In the Apostle Paul’s opinion, Mark was unfit for service and didn’t deserve a second chance (see Acts 15:36–38). How devastated John Mark must have felt about this! But the end of his story had not yet been written. Later on, his presence was desired by the same Apostle Paul, because “he is helpful to me in my ministry” (2 Timothy 4:11). Mark also became a blessing to the whole Church by writing the story of Jesus in our second Gospel. What an encouragement he was not just in his own lifetime, but to the many ages that have followed. Time and time again, God has taken marred pots and turned them into vessels of His praise. Not only does He make them more beautiful, but through them, He also brings about His perfect will. Truly, His ways are above our ways. Sin and Failure—Good or Bad? Pay attention! Although God’s grace abounds to us—His ways far above our understanding—and He is able to transform our failure, don’t trample under foot the Son of God and treat His blood as an unholy thing by deliberately sinning (see Hebrews 10:26–29). when he declares us sinners to be innocent. preach! (Romans 3:5a, 8, NLT). Yet the fact remains that no one is righteous. We all fail. But we don’t have to continue to live in sin. God’s grace is always there to help us become better people. We should be maturing children who bring Him praise—not just for the sake of His grace, but for the work of God to restore that which sin destroys. Are you still wrestling with, “How can God bring about His perfect will when I messed up so completely? I mean, I deliberately did what God did not want me to do. How can His ‘perfect’ will still be accomplished in my life?” You are not alone in your struggles. If we looked at every single Bible illustration in which God did this precise thing, we still would not fully “understand” it. Actually, it is not possible to totally grasp this concept with our finite minds. His ways are far above ours. God views our lives from a totally different vantage point. He knows the end and how He intends to get us there. Not only does He have that amazing perspective, but He also is preparing us for eternity, not for tomorrow, not for next year, not even for our lifetime on earth. We so easily evaluate if we are on course by our current achievements, the opinions of men and our own view of what we are aiming toward, and our current status. But we forget, we are made not for time, but for eternity. All that happens in our lives is a classroom in which God is preparing us to reign with Him throughout eternity. Can you believe God has something much greater in mind than simply your reputation among the people you are with this very day? He has thoughts about us that go far beyond what we can even begin to consider. He is working outside of our realm of reference. None of us can totally understand God and His ways with our limited minds. We simply aren’t capable. But we can believe Him. We don’t have to understand everything to accept what He says is true. If God says it, we must believe it. Don’t fall into the trap in which you will only believe God if you completely understand Him. Your unbelief will hinder the transformation He wants to bring about in your life. Please don’t be a doubter. Join your heart with His and simply believe. Choose to let go of yesterday and embrace the gift of all the todays that the Lord Himself has lavished upon you. This entry was posted in When We Have Failed - What Next? and tagged abortion, Bible, cancer, Christianity, Discipleship, encouragement, Failure, gfa, Gospel for Asia, holy spirit, Hope, hopeless, Jesus, Jesus Christ, K.P. Yohannan, Missionaries, Missions, sickness, suicide, trinity on May 4, 2010 by gfaseo.